NBA great Dennis Rodman flew to Singapore for the historic meeting between United States president Donald Trump and North Korean leader Kim Jong-un. Former San Antonio Spurs and Chicago Bulls star Rodman has struck up an unlikely friendship with Kim having first attended the country in 2013, and has in the past spoken of how he helped to bring the two countries together amid tense diplomatic relations. Trump and Kim made history by becoming the first sitting US president and North Korean leader to meet, with the two shaking hands at a hotel in Singapore before signing an unspecified document. Last week, Trump stated that Rodman had not been invited to the summit, in which discussions were held to defuse tensions and work towards nuclear disarmament, while White House officials also said the five-time NBA champion would not have an official role. Upon arriving in Singapore, Rodman told reporters: "Trump could have said something different [in the past], Kim Jong-un could have said something different. "I think it's fair to say both will see how this meeting is going to go, it should go fairly well but people shouldn't expect so much for the first time. Hopefully, like I said, it seems like the doors are opening." 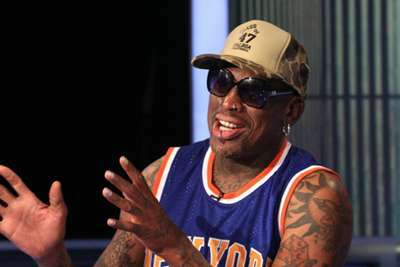 An emotional Rodman later added in an interview with CNN: "It's a great day. I am here to see it. I'm so happy. "Once I got familiar with the culture and situation [from previous visits], I felt like I was at home. "I'm not in this for no money. I never started it for no money. This is not about Dennis Rodman being the greatest person in the world, bringing the countries together. "I think the fact that Trump would understand that the people of North Korea have a heart, they have soul, charisma, and they love each other."